Read an interesting news article on yahoo about the almost 100% certainty that the Federal Reserve will cut interest rates again. Possibly by a full percentage point to make it 2%. This means that the US$ will be under attack again, fueling inflation fears and making it more likely that stagflation will happen. There are two things which needs to be done. 1. 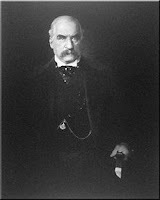 The world and USA needs a little of someone of the stature of the old John Pierpoint Morgan in the early 20th century. This is to bind all the financial firms operating in the USA and who holds sub-prime or any type of mortgages. So if there is a bank run or flight of capital from any institution, the rest will stand by these firms and provide the liquidity to make it solvent and viable. This prevents the domino effect where banks fall in turns until there is a systemic failure in the credit market and all credit dries up. Some may argue that there are firms which are relatively unaffected by the sub-prime so why should they be involved? The counter is that all the financial firms lend to companies and each other in a global economy. Here in small Singapore, some of the local banks here had written down assets because of the sub-prime meltdown. And more to the point no one knows for sure which firms have yet to announce losses due to this. The key is that when it spread to firms which fail not because of sub-prime but because of the secondary effects of this contagion, then it may be too late. 2. The small home owners in US affected by the sub-prime or have yet to be but are servicing unbearable interests but cannot refinancing their mortgages because no banks or mortgage firm are willing to bear the risk needs to be taken care of. Or the contagion will be a full fledged housing loan crisis, not just the sub-prime. Home owners at risk or are defaulting needs to be taken care of by immediately nationalising the housing debt to be service at near to the levels that the Federal Reserve is providing for the banks and at risk financial firms. It is no good just taking care of the banks while a disaster in the making looms in the background. The next wave of defaults could flood the whole financial edifice, even if they are united. So this is even more pressing than point 1. When the crisis settles, a tax on the financial firms will be impose to recover any monies extended by the government to resolve the crisis, including the costs of nationalising the housing debt. These debts will be rated by independent rating agencies or auditors before being sold off to the banks and financial firms. Dangerous times calls for extreme action and government intervention.